The simplest hydrocarbon, methane, is a gas (at standard temperature and pressure, STP) with a chemical formula of CH4. Pure methane is odorless, but when used commercially is usually mixed with small quantities of odorants, strongly-smelling sulfur compounds such as ethanethiol (also called ethyl mercaptan), to enable the detection of leaks. Methane's relative abundance and clean burning process makes it a very attractive fuel. However, because it is a gas and not a liquid or solid, methane is difficult to transport from the areas that produce it to the areas that consume it. Converting methane to forms that are more easily transported, such as LNG (Liquified Natural Gas) and methanol, is an active area of research. Methane is a greenhouse gas with a global warming potential over 100 years of 23. When averaged over 100 years each kg of CH4 warms the earth 23 times as much as the same mass of CO2. The Earth's crust contains huge amounts of methane. Large amounts of methane are emitted to the atmosphere through mud volcanoes which are connected with deep geological faults or as the main constituent of biogas formed naturally by anaerobic digestion. At room temperature and standard pressure, methane is a colorless, odorless gas. It has a boiling point of -162 °C at 1.00 atmosphere and is extremely flammable. Methane is not toxic. The immediate health hazard is that it may cause burns if it ignites. It is highly flammable and may form explosive mixtures with air. Methane is violently reactive with oxidizers, halogens, and some halogen-containing compounds. Methane is also an asphyxiant and may displace oxygen in an enclosed space. Asphyxia may result if the oxygen concentration is reduced to below 18% by displacement. The concentrations at which flammable or explosive mixtures form are much lower than the concentration at which asphyxiation risk is significant. When structures are built on or near landfills, methane off-gas can penetrate the buildings' interiors and expose occupants to significant levels of methane. Some buildings have specially engineered recovery systems below their basements, to actively capture such fugitive off-gas and vent it away from the building. An example of this type of system is in the Dakin Building, Brisbane, California. Main reactions with methane are: combustion, hydrogen activation, and halogen reaction. In general, methane reactions are hard to control; partial oxidation to methanol, for example, is difficult to achieve; the reaction typically progresses all the way to carbon dioxide and water. Methane is important for electrical generation by burning it as a fuel in a gas turbine or steam boiler. Compared to other hydrocarbon fuels, burning methane produces less carbon dioxide for each unit of heat released. Also, methane's heat of combustion is about 902 kJ/mol, which is lower than any other hydrocarbon, but if a ratio is made with the atomic weight (16.0 g/mol) divided by the heat of combustion (902 kJ/mol) it is found that methane, being the simplest hydrocarbon, actually produces the most heat per unit mass than other complex hydrocarbons. In many cities, methane is piped into homes for domestic heating and cooking purposes. In this context it is usually known as natural gas. One standard cubic foot of methane will produce roughly 1,000 BTU (1.06 MJ = 293 W-hr) of energy. Methane is used in industrial chemical processes and may be transported as a refrigerated liquid (liquefied natural gas, or LNG). While leaks from a refrigerated liquid container are initially heavier than air due to the increased density of the cold gas, the gas at ambient temperature is lighter than air. Gas pipelines distribute large amounts of natural gas, of which methane is a significant component. In the chemical industry, methane is the feedstock of choice for the production of hydrogen, methanol, acetic acid, and acetic anhydride. Less significant methane-derived chemicals include acetylene, prepared by passing methane through an electric arc, and the chloromethanes (chloromethane, dichloromethane, chloroform, and carbon tetrachloride), produced by reacting methane with chlorine gas. However, the use of these chemicals is declining, acetylene as it is replaced by less costly substitutes, and the chloromethanes due to health and environmental concerns. The major source of methane is extraction from geological deposits known as natural gas fields. It is associated with other hydrocarbon fuels and sometimes accompanied by helium and nitrogen. The gas at shallow levels (low pressure) is formed by anaerobic decay of organic matter deep under the Earth's surface. In general, sediments buried deeper and at higher temperatures than those which give oil generate natural gas. Apart from gas fields an alternative method of obtaining methane is via biogas generated by the fermentation of organic matter including manure, wastewater sludge, municipal solid waste, or any other biodegradable feedstock, under anaerobic conditions. Industrially, methane can be created from common atmospheric gases and hydrogen (produced, perhaps, by electrolysis) through chemical reactions such as the Sabatier process, Fischer-Tropsch process. Coal bed methane extraction is a method for extracting methane from a coal deposit. It is also caused by cows' natural gas. 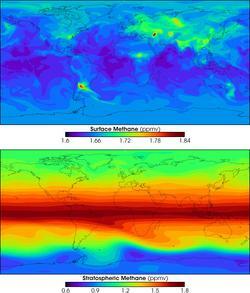 Computer models showing the amount of methane (parts per million by volume) at the surface (top) and in the stratosphere (bottom). Methane in the earth's atmosphere is an important greenhouse gas with a Global warming potential of 23 over a 100 year period. Its concentation has increased by about 150% since 1750 and it accounts for 20% of the total radiative forcing from all of the long-lived and globally mixed greenhouse gases. The average concentration of methane at the Earth's surface in 1998 was 1,745 ppb. Its concentration is higher in the northern hemisphere as most sources (both natural and human) are larger. The concentrations vary seasonally with a minimum in the late summer. Methane is created near the surface, and it is carried into the stratosphere by rising air in the tropics. Uncontrolled build-up of methane in Earth's atmosphere is naturally checked-although human influence can upset this natural regulation-by methane's reaction with a molecule known as the hydroxyl radical, a hydrogen-oxygen molecule formed when single oxygen atoms react with water vapor. Early in the Earth's history-about 3.5 billion years ago-there was 1,000 times as much methane in the atmosphere as there is now. The earliest methane was released into the atmosphere by volcanic activity. During this time, Earth's earliest life appeared. These first, ancient bacteria added to the methane concentration by converting hydrogen and carbon dioxide into methane and water. Oxygen did not become a major part of the atmosphere until photosynthetic organisms evolved later in Earth's history. With no oxygen, methane stayed in the atmosphere longer and at higher concentrations than it does today. Slightly over half of the total emission is due to human activity. Ads A website like www.payanname.com will provide you with the highest quality in the industry. Are you looking for "emu online applications for graduates"? Check out cyprusuni The passionate experts in this field are ready to answer all of your requests.